The Nintendo DSi is the third model of the Nintendo DS family, announced on October 2, 2008. It is thinner and lighter than its predecessor, the Nintendo DS Lite, with the Game Boy Advance slot being removed. However, this means that the Nintendo DS Rumble Pak, which was used with titles such as Mario & Luigi: Partners in Time, cannot be used. Two cameras, music playback functions, Wi-Fi, internet browser, larger screens, and a Wii-like channel interface were added. There was also an app called Flipnote Studio which allowed players to create their own animated flipbooks. The Nintendo DSi has sold 17.82 million units, while the DSi XL sold 2.08 million units as of March 2010. The DSi is also able to download games from the Nintendo DSi Shop (DSiWare), stored on an SD Card or in internal memory. The DSi's front has a camera lens, and another, smaller lens is located where the mic was positioned on the Lite, allowing for photos to be taken with the DSi open. 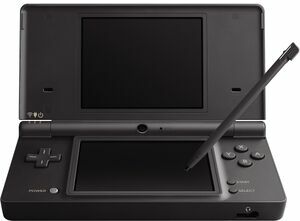 A special limited edition DSi was sold on Friday, November 27, 2009 ("Black Friday") in the United States only. It was available in Metallic Blue and came preinstalled with five Mario DSi games/apps, namely Mario vs. Donkey Kong: Minis March Again!, WarioWare: Snapped!, Dr. Mario Express, Mario Calculator and Mario Clock. A red DSi XL also came in a special Super Mario Bros. 25th Anniversary Edition DSi package. The Nintendo DSi XL (DSi LL in Japan) is a revision model of the DSi. It includes larger screens with a diagonal of 107 mm (4.2 inches) (93% bigger then the DS Lite and the regular DSi's screen). The size and weight are increased accordingly so that the new model weighs 50% more than the DSi. According to reports, Nintendo wants to aim the new version to older gamers who might have trouble seeing the screen of a regular DS model. The handheld console was released in Japan on November 21, 2009, in Europe for March 5, 2010  and on March 28, 2010 in North America. In Japan, the DSi XL comes preinstalled with Brain Age Express: Arts & Letters (also known as A Little Bit of... Dr Kawashima’s Brain Training: Arts Edition), Brain Age Express: Math (also known as A Little Bit of... Dr Kawashima’s Brain Training: Maths Edition) and Kiyou Akira Rakuhiku Language Easier. In North America, the DSi XL includes both of the Brain Age titles: Brain Age Express: Math and Brain Age Express: Arts & Letters, along with the Photo Clock. In Europe, the DSi XL comes preinstalled with Dr Kawashima’s Brain Training: Arts Edition (with an additional Dutch language copy), Dictonary 6 in 1 with Camera Function, Nintendo DSi + Internet video, Nintendo DSi Browser and later Flipnote Studio. It has been requested that this article be rewritten and expanded to include more DSi-enhanced games. These games are compatible with Nintendo DS but can do more things if ran on a Nintendo DSi, such as utilize WPA and WPA2 wireless standards as the original Nintendo DS can utilize WEP standard only. One way to tell if a game is DSi-enhanced is the 10-character game ID divided by two dashes on the cartridges, located on the bottom-right of each label. If it has the prefix TWL (codename Twilight for DSi) instead of NTR (codename Nitro for DS), it is DSi-enhanced. The DSi-enhanced games are also Region-Locked (just like the iQue DS Cartridges and later the 3DS and New 3DS ones). The red Nintendo DSi (Japan and Europe only). Special Mario "Black Friday" DSi. Commemorative DSi for the Super Mario Bros. 25th anniversary. Budgy, a parakeet character from the Nintendo DSi, has a phrase about Princess Peach infiltrating a castle in the DSi Sound application. If the player records a sound and waits, the Super Mario Bros. theme starts playing using the recorded sound as instrument. This page was last edited on July 8, 2018, at 18:44.